LBi Atlanta wins at the 2011 Atlanta ADDY Awards for its innovative pest forecaster for Spectracide, a leader in outdoor insect control. LBi Atlanta, a division of the world’s largest independent advertising, marketing and technology agency, won a Silver ADDY Award for its innovative work with Spectracide® pest solutions. Announced yesterday in a ceremony at Turner Field’s 755 Club, the award recognizes LBi’s success in the Interactive Media – Microsite Division. The ADDYs—the advertising industry's largest and most representative competition for creative excellence—acknowledged LBi for its creation of the Spectracide Interactive Pest Finder (IPF). 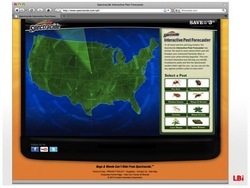 Launched in June 2010, the IPF (http://www.spectracide.com/IPF) is an interactive Flash application that allows users to identify a specific pest (insect or plant) and instantly receive information about the appropriate Spectracide solution and where to find it. Spearheaded by LBi Atlanta Group Creative Director Matt Daly, the IPF features an animated U.S. map that clearly shows annual pest lifecycles relevant to a user’s location. It provides pest information and features videos demonstrating how Spectracide products should be used for maximum effectiveness. “LBi Atlanta has done an excellent job … building the foundation for what will be an ongoing interactive space to educate consumers on how Spectracide products solve consumers’ lawn and garden problems,” said Ryan Andersen, Spectracide Associate Brand Manager. LBi is the world’s largest independent advertising, marketing and technology agency, blending insight, creativity and expertise to solve business problems. The largest genuinely full service agency of its kind, LBi provides the full range of capabilities, including digital strategy, branded content, service design, media, CRM, technology, managed hosting and support services.